The rate at which concerts get booked follows a nonlinear path. It takes a long time before the first concert gets booked. At some point it takes off. 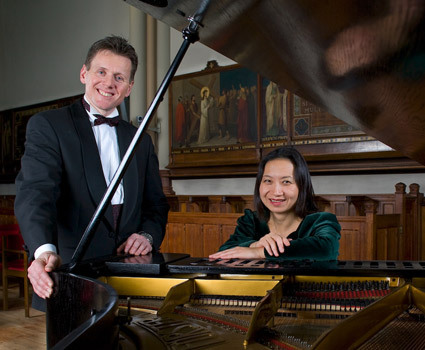 Bekkers Piano Guitar Duo visit the USA in mid-October 2010 — this is their story. In a recent skype conversation with the London-based composer David Harvey, I observed that our concert bookings are speeding up. At first nothing seemed like happening. And now, every other e-mail is landing in good prospects. David calls it the high school disco model. No one wants to be first on the dance floor. When it gets packed with dancers, everyone wants to squeeze into the little space that’s left. Call it the herd mentality. I call it the nonlinear process of concert bookings. Who is going to arrange the first concert? The second? At first, we did not know where to start. We obtained our visas in April 2010. We had to validate it by 21st October 2010. We had to pick a destination to book our flights. Go where we’ve performed before? Houston and Maui. Go where we’ve not visited before? That’s the rest of the USA. And the rest of the USA is HUGE! Start from the East Coast and work our way to the West and then back again? Book our flights while they are on sale and then get the concerts? Every time we started to book our flights, we got stopped. Where do we fly to? When do we leave? When do we come back? Wait and get a concert booked? But where did we want to go? Our friends in Phoenix said the same thing. Other friends in DC area, Florida, North Carolina, …. in fact everyone who knew we were planning a trip to the USA told us that they’d love to see us in concert if we’re in their area. So I wrote a blog: house concerts for your friends and forwarded to a few friends. One of them approached a community music school near her home. Another wrote a personal email introducing us and sent to all his friends who in turn forwarded to their friends, who forwarded to theirs. Before long, one of the email recipients expressed interest in organising a concert for us in his home. It took a few short e-mails and a short webcammed skype conversation with the host of the North Meadow Concert Series in mid-August to agree on a concert and a date 23rd October. That house concert in Connecticut was sold out within a week of its publicity. A week later (still in August) a house concert was booked for 22nd October. As far as I know, there are still seats available in Newton, Massachusetts. In early September, we were asked to confirm a concert in a big church in Boston. We couldn’t for the 14th of October, for we had a concert to give in Rotterdam on the 15th. We have a week to go before we embark on this concert tour of the USA. We call it the scenic route from Boston to Maui. We will end our New England adventure in New York for a brief glimpse of the Big Apple before flying to North Carolina for a short visit. [New York deserves a separate, long visit.] At Duke University, we will be playing in the concert hall where I gave my senior recital. We will just miss our friends from Singapore who land in Raleigh/Durham Airport an hour after we take off for Phoenix. In Phoenix, we will be playing at two community colleges and also a new Salon series. We will see a friend I’ve not seen since high school. We will miss the Grand Canyon on this first trip to Phoenix and fly to Houston for a private concert on the 6th of November. Right now we’re arranging concerts for Houston & the vicinity and San Francisco & the vicinity. We’ll have to book our flights for Houston – SFO and get to Maui for Thanksgiving. We will see old friends and new friends we’ve not yet met. It’s nonlinear. And it’s speeding up…. FAST!